On January 29th, the first season of David Milch’s new HBO show, Luck, will begin – and it shows every sign that it can live up to the best that both Milch and HBO have to offer. 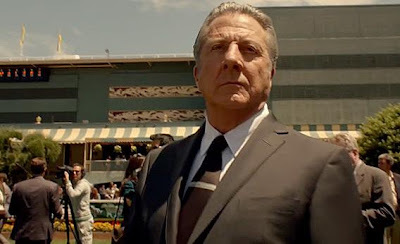 Though we’ll have to wait six weeks to see new episodes of the show (which boasts screen legends Dustin Hoffman and Nick Nolte in their first regular roles in a TV series), this past Sunday HBO gave audiences a sneak peek at the new series when it aired its pilot episode. Coming out of the gate strong, this show takes its time, and respects its audience, subjects, and characters the way that only a show which is truly meaningful to its creators can. Knowing a subject too well can be a liability when making a drama. (David Simon’s intimacy with Baltimore was an asset for most of the run of The Wire, but if the final season staggered just a bit, it was likely because Simon was just a little too close to the world of the Baltimore Sun that he introduced in that fifth season) But here, it seems, Milch’s lifelong association with the racetrack only seems to give him the confidence necessary to take it slow. A story that was basically five decades in the making, it paints a patient portrait of a unique world. 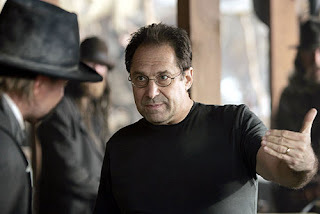 In December 2007, one month into the Writers Guild of America strike that would bring Hollywood to a standstill for three and a half months, David Milch – most famous as the creator of HBO's groundbreaking Western Deadwood – gave a series of impromptu lectures before a small audience of fellow writers and strikers at the WGA Theater in Beverly Hills. (An astute soul taped the talks, and they have been available online ever since. For the singular insight they offer into one of television's most creative and dangerous minds, I cannot recommend them more.) Interspersed with anecdotes about his first sexual encounter and his decades-long struggle with drugs and alcohol, the extemporaneous lectures touched on everything from Milch’s philosophy of writing, the deep ambivalence TV writers feel towards their bosses, and the essence of the creative process, to the life of St Paul and the nature of religious faith. And Milch also spoke about two very personal television projects that he’d been kicking around for a long time, both of which were extremely personal to him, and neither of which (he implied) he expected to ever see the light of day. One was a show about the racetrack. Luck is that show. The pilot (directed by Michael Mann, who also is one of the show's executive producers) is beautiful to look at, and the world it presents is lovingly portrayed in all of its grit and glory. The star power of Hoffman and Nolte notwithstanding (and Hoffman is truly stunning in every one of his scenes, emanating maturity and depth with every look), this is a true ensemble show. In this first hour alone, we are introduced to a dozen characters, and every one of them shines in their brief time on screen – from the veteran horse trainer Escalante (John Ortiz), the young jockey Leon (Tom Payne), to the unnamed “exercise girl” (Kerry Condon, Rome). 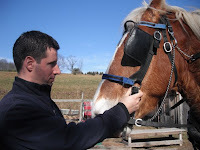 The horses themselves have already begun to become unique characters. (Nolte’s character’s horse already threatens to upstage him in their shared scenes.) Milch wrote the script for the pilot, and if Deadwood is any precedent will most certainly be at least co-credited with the script for every subsequent episode. This show offers an understated, subtle and sincere portrayal of an entire world – whether taking in meditative scenes in the locker room, watching the jockeys weigh out, or listening in to manic conversations about which horse should be favoured in the 6th race, every scene delivers to the audience the understanding that this is a world that is multi-layered and in full motion, and does not simply spring into being when our star characters appear. The scenes in the stables and the scenes on the track are breathtaking, and even those who are not particular attached to horses will experience the heart thumping thrill of seeing thoroughbreds run. And those who are familiar with the world of horses will appreciate the love and devotion of all the characters to these animals, and the respect with which Milch treats the tragedies and triumphs of racing. 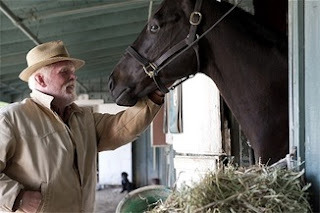 If Milch’s deep history with the track is showing itself in anything, it is with the love and respect almost every character has for the horses themselves. Even the snarling jockey agent (portrayed with relish by sitcom veteran Richard Kind, Mad about You) is given a small moment of sublime awe, a brief smile passing over his face as he stops and just looks at the new horse in town. And unlike some of HBO’s most impressive, but initially impregnable, offerings (Milch’s own Deadwood, and the sublime The Wire), Luck comes out of the gate as a much more welcoming show. Perhaps it is simply a feature of the racing world itself: no-one really knows what’s going on, but they show up every day trying to figure it out, waiting for that big payout. Whatever addictions, anger, personal agonies these people are living with, they all know the real thing when they see it. And as a result, so do we. Anonymous, really? On Critics at Large? Bahaha! Great review. I can't wait for this to start so I can watch. Not sure the show is going to convince him to start riding though!